One of two famous Chicago neighborhood maps was a result of the Comer funded CITY 2000 project. This story by Rick Kogan is excerpted from the Chicago Tribune, November 30, 2015. There are, by the count of cartographers and real estate developers and politicians, God knows how many neighborhoods in Chicago. And no matter how sad and downtrodden, how happy and polished, people live and work in all of them. 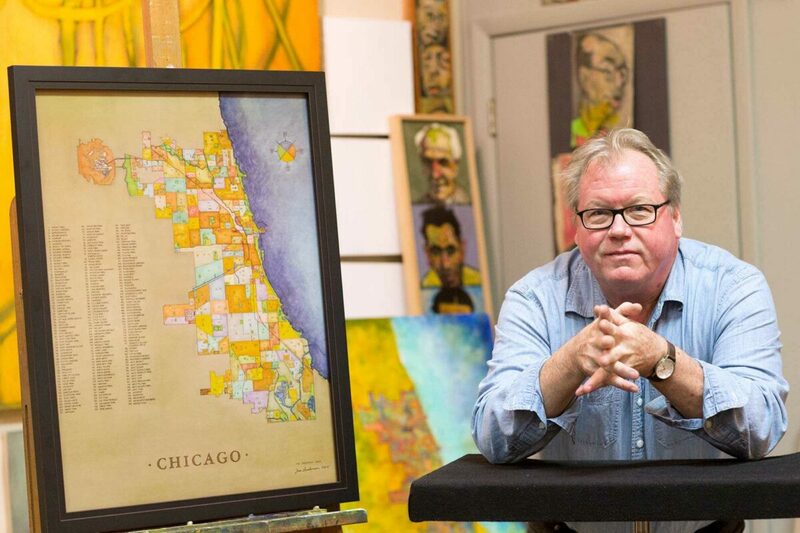 Visual artist Tim Anderson lives and works in the West Town neighborhood, which is where he created what is perhaps the finest and most attractive map ever made of this city. Originally a child of the north suburbs, he has toiled for decades in Chicago, his fascination with its history and its characters (both good and bad) informing much of his work. He got hooked on those who shaped and shared the city's past when he was an eighth-grader in Wilmette. "It was (Richard J.) Daley who really did it," he says. "He was just so big, larger than real, that it really kicked in an interest, further fostered by one relative who was a Chicago businessman friendly with Mayor Anton Cermak and another who was a crime reporter." And so he has made hundreds of paintings, of mobsters and pols, ballplayers and builders. He recently came across a painting he completed 15 years ago, one of his most ambitious projects. It is a map of the city that he was asked to make at the request of Gary Comer, a wonderfully generous man who grew up poor in the Grand Crossing neighborhood, made it big by founding Lands' End and spent much of his life giving his money away. When Comer died in 2006, his friend Lois Weisberg, then the city's cultural affairs commissioner, said: "There was nobody like Gary, and it wasn't about money, about the numbers. His contributions to this city will be felt for generations."